This report comes down on the side of concluding that indeed a new, secular Bull Market has begun. While there is still some chance that a bear market (D) wave top could come in the vicinity of the 2007 highs, evidence is mounting that the 2011-2012 period was an (E) wave of a long term triangle and that recent price breakouts and changes to the technical character of the market mark the start of a very long term Major (V) bull market. The Dow Jones Industrial Average appears to be projecting to a completion of the ongoing bull market from the 1932 low in the area of 18,800 in the late 2015-early 2016 time frame. My current analysis is that the S&P 500 has reached an intermediate term top in the context of the early stages of a impulsive bull market wave. The latest technical development supporting the bull market thesis is that we have seen the completion of a rather clear Elliott Wave 5 sequence bullish impulsive wave with subwaves that also show bullish impulsive structures and characteristics. On March 15th the market began a Wave 2 correction of the Wave 1 that started in November 2012. This corrective wave could be expected to last an additional 3-6 weeks and should retrace about 38.2% of Wave 1. Three weeks later, it appears likely that the intermediate term correction may be over. SPX has apparently corrected in a sideways triangle within a bullish parallel channel. The correction did not approach the minimum 23.6% retracement generally associated with an intermediate term correction and did not break horizontal or channel support (at least not yet, anyway). The wave corrected just 14% of the prior move at its maximum depth. There has been a decent correction of technical indicators, however, on the daily and weekly time frames, such that the market is no longer overextended. If a market has transitioned into a new phase, then indicators should be expected to behave differently. We are already seeing that many technical conditions which had previously been solid markers of a top are no longer. One of the mistakes that analysts are likely to make in the coming months is that they will be relying on bear market methodologies to trade bull market conditions. We are going to need to look for new setups to trade this bull effectively. Fortunately, if we are in an impulsive bullish environment, longer hold times will be possible and fewer trades will be necessary. Indeed, the technical setup we saw beginning with the March 15 top was identical to that which had pertained to the 2010, 2011 and 2012 tops, yet in this case we did not see the same intermediate term price correction but rather a minor correction within the trend. This sets up the potential for a breakout above the 2007 highs after a 5 week consolidation and if this happens it would come in a powerful Wave 3 position in the context of an extended Wave (1). That means a large, strong, persistent bull move may be on the calendar in the near term. Tape action has been bullish, particularly of late. Support levels have been bought persistently, particularly the 50 Day EMA. Bad news and heavy selling in stocks such as GE and IBM have not impacted the broad market or even their respective sectors. The market is treating each stock on its own merits. That's bullish tape action as it shows selective behavior by investors. At the same time, we are seeing some significant long term breakouts. Microsoft and the Semiconductor sector come to mind. There have been very few "pop and drop" earnings news reversals, a sign that investors are not looking for the exits on good news and that stock is held by strong hands. Recently we have seen markets in the US, China and Europe rally strongly on bad economic news when they were potentially positioned to break down. Altogether, we have seen market behavior that tends to correlate well with the long term bull market thesis. The hope was that we might sell longs and even take a short position during the intermediate term correction with an eye towards putting on a larger long position at the bottom. That was a quite reasonable scenario under the circumstances that existed at that time. The fact that the market has refused to allow that is another very bullish indication. We cannot yet entirely dismiss an intermediate term correction from these levels. Certainly if we get a dismal GDP report on Friday morning that could be enough to spark a round of heavy selling and a break of support. But even so, at this time I would regard the decline as a buying opportunity. There is little technical evidence to support a Major (D) wave top at this time. It would take a steep decline followed by a B wave rally to a marginal new high with associate long term technical divergences to set up a new cyclical (E) wave bear market. Most analysts continue to make the mistake of believing that a secular bull market started in March of 2009. The actual situation of this market very closely parallels the 1974-1982 time frame. While the price bottom was made in 1974, the actual secular bull did not begin until the 1982 low. 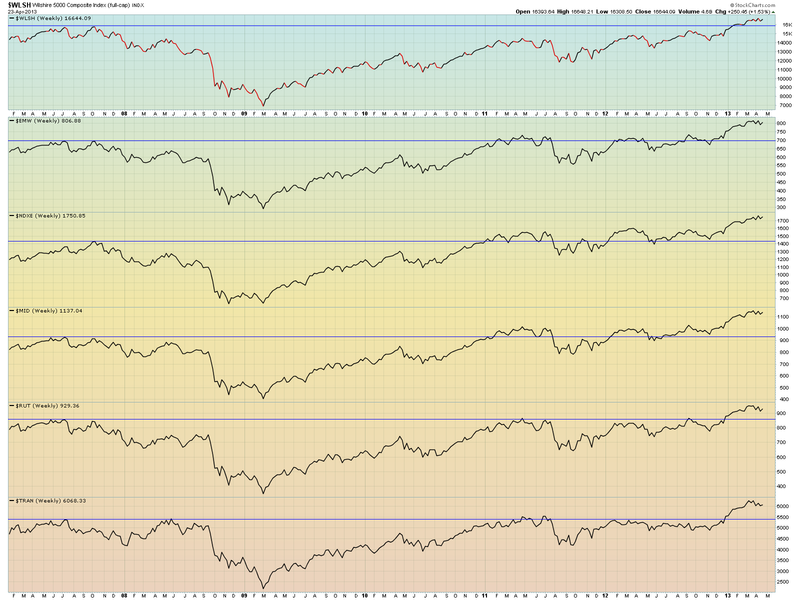 Our contemporary 2009 bottom and November 2012 low are playing the same role and function. While a great many market participants believe that this bull is "long in the tooth" and fret that the market is at or near the prior all time highs, a correct understanding of the actual context of the current market setup shows that instead we are yet in the early stages of a secular bull. It's also important to note that while skepticism regarding the market rally is not as negative as it was in 2010 and 2011, it is roughly comparable to the period of the 1982 breakout. Now as then, optimism is growing with a lingering backdrop of deep skepticism and fear. The general investing public is still largely ensconced on the safety of bonds or in cash. As a technical analyst I am free of the burden of needing to understand why the market is doing what it is doing. I am strictly concerned with what it is doing, what it is setting up to do and what it is likely to do. Having said that, it is helpful sometimes to reflect on the underlying fundamental forces driving a market along. There appear to be two primary characterizations of the fundamental environment. The first regards the rising stock market as an inflationary epiphenomenon of massive global monetary liquidity. The second anticipates significant, dynamic economic growth nationally and globally that will eventually become evident and will explain and justify rising stock valuations. The two year bear market in commodities and the recent plunge in metals prices would seem to contradict the inflationary market hypothesis. If inflation were the motive force here, it should effect all asset classes. That gold, the ultimate inflation hedge, has been in a bear market during most of the Quantitative Easing experiment would seem to refute inflation as a primary driver of the stock market bull. There are not yet any clear signs of the emergence of new, dynamic growth sectors in the US economy and internationally signs of slowing in the Chinese growth engine. If the market arrives at a technical top in the 2015-2016 time frame without any real, organic underlying economic growth, then it will be likely set up for the grand super cycle debt bubble pop that so many doomer economists and analysts have been calling for. My current view is that clearly monetary inflation is playing some role in generating the conditions for the stocks bull market. It is making bonds an unappealing option, it is keeping the financial system flush with liquidity and it provides an underlying psychological confidence to investors. But I don't buy the notion that we will get a valid secular bull market on monetary inflation alone. There will have to be some degree of real world economic growth involved. One area that may be playing a big factor is the US energy boom. New technologies are making very large oil deposits accessible that were previously economically unavailable. As the economy becomes more energy efficient through new green technologies, the US may become energy independent and a net exporter of crude by 2020. As supply grows and demand stabilizes, the price of crude oil may fall significantly for a long period of time. In fact the chart is showing signs of following the rest of the commodities complex into a large bear market decline. An economy wide decline in energy costs could be an enormous boon to the US, setting up a resurgence of global competitiveness. Another key factor is technology and innovation. For example, the 3D Printing revolution could have profound and dynamic effects on the relationships between products, consumers and manufacturing. Radical new materials also offer the potential for dramatic developments in economies of scale, energy efficiencies, production and distribution. It's also important to keep in mind that US corporations are currently very lean and efficient and sitting on record cash piles that if invested under the right circumstances could propel a real economic boom. And much like the 1995-2000 period, the US dollar may rise on the strength of demand for dollar denominated assets as the world once again makes the USA the preferred investment haven. In fact the dollar is showing signs of a long term bottom very analogous to the bottom made in the 1995 period. Keynesian monetarism has distorted and retarded national and global economic growth. If market forces had been allowed to prevail for the last 40 years, many of the economic, social and technological hurdles we are now seeking to clear would have been long ago surmounted. Fiat debt money creates malinvestment, distorts financial systems, skews wealth distribution, corrupts political systems, creates a dependent, undereducated labor force and fosters the worst in human character. To the extent that we have needed extreme measures to exit the problems of 2007-2008, those who have taken such measures are to blame for creating the circumstances that required them. It's going to be infuriating to anyone who advocates economic freedom and sound money, but I think we are bound to see the Keynesian Monetarists gloat that they have proven the integrity of their "model" for the next few years. And then? Will the chickens produced by the so many debt eggs laid over so many years finally come home to roost? I think there is a technical case for that top of all tops in the 2015-2016 period. And if the right technical circumstances come together against a backdrop of an inflated market without any real underlying dynamic growth, then the gold bugs and doomer economists may finally have their day to gloat. But as they say, "Be careful what you wish for...because you just might get it." If an (E) wave bear market were on the table, we would not be seeing such outperformance; instead we would be seeing the opposite. Need some help staying on the right side of the markets? Join the BullBear Traders room at TheBullBear.com. You'll get this kind of timely, incisive, unbiased stock and financial market trading, timing, forecasting and investment technical analysis and commentary daily. It's free to join, no credit card is required and if you like my work you just make a donation at the end of each month. PLEASE CONSIDER MAKING A DONATION TO SUPPORT MY WORK USING THE PAYPAL LINK BELOW. THANK YOU! You need to be a member of BullBear Trading: Stock and Financial Market Technical Analysis to add comments!